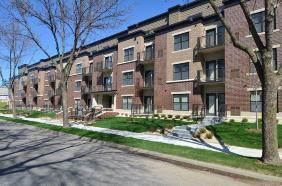 Station 38 Apartments is our newest development that opened spring, 2012. It is a 64 unit apartment building located just steps from the 38th Street Light Rail Transit Station. Each of Station 38’s apartments has a carefully designed floor plan, complete with full-size washers and dryers, contemporary kitchens and ceramic tile baths. Most units have private balconies, patios or front stoops. A select few have spectacular views of the Minneapolis skyline. Visit www.station38apartments.com for more information.